Jacoby Tarbox's full line of high pressure threaded bulls-eye sight flows have been precisely engineered per the design criteria of ASME/ANSI to yield a nominal rated unit for flow observation and indication. Critical pathways containing gases, fluids, or slurries can easily be monitored in Jacoby Tarbox's highest pressure rated bulls-eye sight flow indicators. Available in a wide range of connections, these sight flows can be installed in a variety of process lines. Pipeline view is maximized, with a diameter that is at least as large as the nominal pipe size, allowing 100% unobstructed process observation of your media. All models offer minimized pressure drops with their non-restricting, smooth, full bore construction. These units are bi-directional and may be placed in any orientation. Used primarily in processes where spot indication is desired to detect presence of media, or to inspect color, clarity, turbidity, or other critical characteristics. Model numbers include: S-100HP-NF-* (* would be maximum pressure rating i.e. 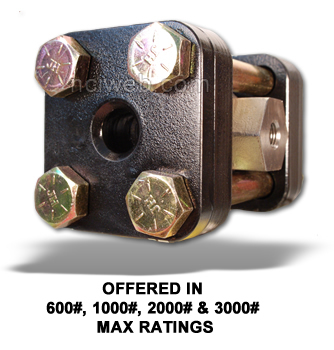 600, 1000, 2000 or 3000psig - for example S-100HP-NF-600). This unit employs a 316 SS hinged weighted flapper to indicate flow of media. The velocity of the flow is indicated by the position of the flapper. Uni-directional, these units are optimal for horizontal or vertically upward flows. Model numbers include: S-100HP-* (* would be maximum pressure rating i.e. 600, 1000, 2000 or 3000psig - for example S-100HP-600). The TFE rotor allows for easy bi-directional, multiorientational flow direction. The speed of the rotor indicates the relative velocity of the media. Ideal for opaque liquids or heavy gases for an easily contrasting detection at far viewing distances. Extra durable stainless steel rotors are available as an option. Low, intermittent flows are easily detected with this uni-directional style in the horizontal or vertically downwards direction. The drip tube forces the process to collect on the lower lip of the 316 SS tube, allowing it to visibly drip downward. Model numbers include: S-200HP-* (* would be maximum pressure rating i.e. 600, 1000, 2000 or 3000psig - for example S-200HP-600). The TFE flutter allows for easy uni-directional indication of low flowing gases and liquids. The thin, ribbon type flutter curls into the pipeline, vibrating at the slightest presence of gas or liquid movement. The flow of the media is indicated by the intensity of the fluttering against the window of the unit. Model numbers include: S-100HP-FLTR-* (* would be maximum pressure rating i.e. 600, 1000, 2000 or 3000psig - for example S-100HP-FLTR-600). Flows are easily detected with this style indicator in any direction. The flow propels the TFE ball around in a random pattern inside the body and in plain view for positive identification. Ideal for liquids and gases. Model numbers include: S-400HP-* (* would be maximum pressure rating i.e. 600, 1000, 2000 or 3000psig - for example S-400HP-600). Note: All 2000 and 3000psig units have a single window holder as a standard feature. This holder protects the glass from the high pressures generated during the torquing sequence. This is a Jacoby Tarbox exclusive feature!